This special custom home sits atop a gorgeous and expansive view over tree tops all the way to Shasta Bally and Bully Shoop.The setting is completely secluded. 14.5 acres boasts a large meadow area at the property's entrance and flat garden areas up higher around the home, plus ATV and hiking trails. Trinity PUD with a solar back up system, which could be expanded. Approach the home through a sweet screened sun room into an open floor plan with 10 foot high beamed and tongue and groove ceilings that add spaciousness. A walnut mantle tops the fireplace and a large functional kitchen with ample counter space and a tall bar and seating invites cooking. Heated tile flooring keeps the home cozy. Climb the custom madrone stairs to up the bedrooms, one with walk-in closet, one with extra office space. The main bathroom features a charming claw foot soaking tub and big window. Outside, a quaint fenced lavender garden and darling potting shed define the yard. Huge barn provides equipment storage. Super spring gravity flow water system has 5000 gallon plus 2500 gal. overflow for fire protection. 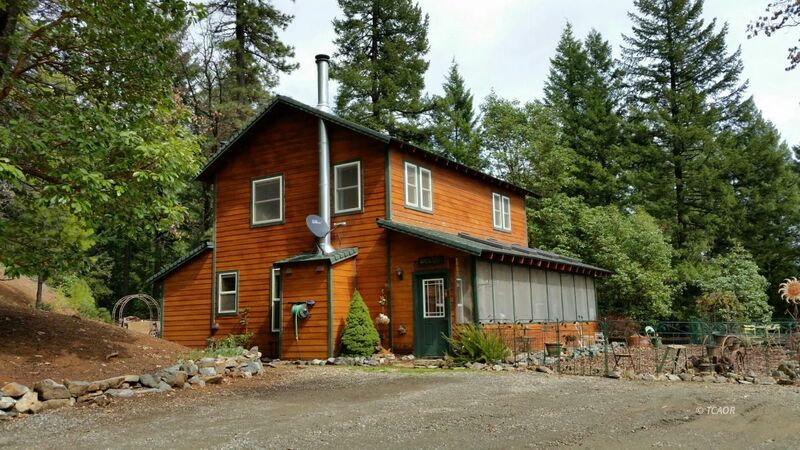 Buyer is advised to contact Trinity County Building Department for zoning verification.